Awendaw Green is bringing back the Charleston Bluegrass Festival April 7 and 8, 2017 at Middleton Place Woodlands. We will be partnering with The Bridge 105.5, Coastal Expeditions, The Aiken Bluegrass Festival, The Bee Cause Project , I GOT LEGS: One-Million Steps: ReEnabled Race Tour and Eagle Endurance It will be a family friendly Lowcountry camping event featuring two stages of regional and local bluegrass and almost bluegrass. It is sure to amaze and inspire. There are a limited number of RV hook ups, primitive camping, single day, and two day tickets. Coastal Expeditions will be renting kayaks Saturday from 11am-6pm for you to enjoy the beautiful lake! Please help us spread the word! We are excited to announce that Palmetto Brewing, Tradesman Brewing Co.,COAST Brewing Company, Freehouse Brewery and Fatty's Beer Works will be featured. Food vendors The Big Southern, Fauzias kitchen, Damiano's Wood Fired Pizza, El Pinchotaco LLC, King of Pops - Charleston, Cold Tap Coffee, and others to come. Venue will have communal fire pits. Some things have a magic all their own. The musical collaboration between Ronnie Bowman, Don Rigsby and Kenny Smith is one of these things. These three men made music together in the 1990’s as members of The Lonesome River Band. Their work there was critically acclaimed and during the apex of the group’s popularity. In 2001, each of them embarked on their own personal musical journeys that led to new heights and influences. ​Following a Lonesome River Band reunion performance, these gentlemen began to explore the possibility of making music together again. They too realized the significance of their past works, but were itching to make new music together. Out of this desire and their longstanding friendship and mutual admiration, Band of Ruhks was born. Bowman, Rigsby and Smith are excited for what the future has in store for this new band. The Band of Ruhks - Coal Mining Man from Fresh Films on Vimeo. The Grass is Dead are a force of Bluegrass and Grateful Dead music. Pickin’ and grinnin’ is what they do best, and they have been adapting Grateful Dead songs in their own bluegrass style since 1998. Always a festival favorite, Grass is Dead is guaranteed to make you smile, smile, smile!!! With a few new members on the roster, the GID are having a blast introducing their new multi-talented band mates to new fans and Old and in the Way fans alike. 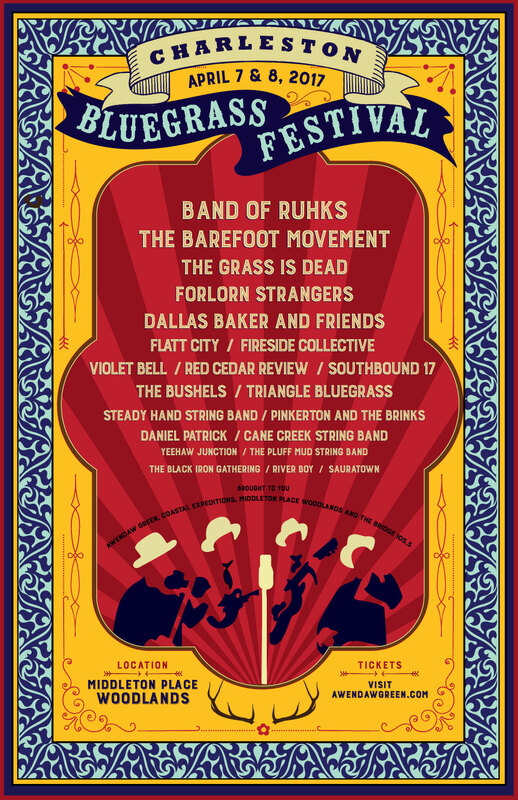 The Barefoot Movement, 2014 IBMA Band of the Year Momentum Award winner, draws from styles of bluegrass, folk, acoustic rock and Americana. With original songs, impressive instrumentation, and interweaving harmonies, this band converges old and new into a style all its own. Forlorn Strangers is a quintet based out of Nashville, Tennessee. The band is a collective of five songwriters, each having their own distinct styles that blend into one unmistakable voice. Their sound delves into all reaches of American roots music, driven by foot-stomping percussion and soaring family harmonies. The band is comprised of sisters Abigail Dempsey (fiddle, percussion, vocals) and Hannah Leigh Lusk (mandolin, percussion, upright bass, vocals); Chris Banke (guitar, mandolin, vocals); Benjamin Lusk (banjo, guitar, vocals); and Jesse Thompson (upright bass, dobro, guitar, vocals). Since 2013, Forlorn Strangers has released two EPs (While the Grass Grows and American Magic Tricks) and has toured continuously across the United States, playing for an ever-increasing group of appreciative fans. In 2015, Forlorn Strangers played over 180 shows in over one hundred cities and more than thirty states nationwide. Dallas Baker is a native of the greater Charleston, South Carolina area. He now resides on James Island with his lovely wife, three children, two rescue dogs, two beta fish, a guinea pig, and a mini-rex bunny. Dallas is a naturalist at Coastal Expeditions by day and music man by night. His passions are his family, playing music, yoga, good food, healthy habits, staying active, surfing, and kayaking. Dallas first started his music career playing heavy metal as a teenager at local music venues. Later on he found his niche in the Bluegrass/Folk/Americana genre. His love for Bluegrass music grew as a member in the band, Steel Rollers. Steel Rollers was known around town for being a rowdy bluegrass band. They brought in a lively and fun crowd to the Charleston Pour House as well as other local music venues in Charleston. After parting ways with Steel Rollers Dallas started up his own band, Dallas Baker & Friends. Dallas describes his music as “Roots Grass”. Dallas Baker & Friends have recorded a 9 track EP with Plowground Productions on Johns Island by Jim Donnelly. You can request to get a copy of this album at any of their shows. Eventually DB&F became a side project for Dallas after he and a friend started up the band, Big John Belly.